Chicago Pedestrian Accident Lawyer | Power Rogers & Smith, L.L.P. When it comes to representing pedestrian accident victims, Power Rogers & Smith, L.L.P. has proven time and time again that we have the experience and knowledge to be successful. Our Chicago pedestrian accident lawyers have helped recover more than $4 billion for our past clients. This is the type of advocacy that sets us apart from the competition and the level of representation you can expect when you hire our team to stand by your side throughout the entirety of your case. Call (312) 313-0202 for your free case review. In a busy city such as Chicago, pedestrians are at direct risk of being involved in a serious accident and sustaining serious injuries. This is often due to a number of reasons and determining the cause of the accident can go a long way in helping an injury victim recover compensation for medical bills, rehabilitation costs, lost wages, and more. Because pedestrians are completely exposed and have no type of protection, an accident can cause significant injuries. Whether you have suffered a spine injury, neck injury, head injury, broken bones, or any other catastrophic damage, our team works with you to build a strong claim. We have been named as the No. 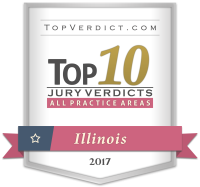 1 Plaintiff’s Law Firm in Chicago by Chicago Lawyer magazine for five consecutive years. You can count on us and our proven track record of success. We recognize that a number of injury victims put off looking for a lawyer because they are concerned about the legal fees involved. Our team at Power Rogers & Smith, L.L.P. works on a contingency fee basis, meaning we do not charge you unless we win. We know that financial hardships are something you may already be experiencing and we don’t want to add to this problem. We have the type of track record you can have confidence in with so much on the line. Ready to begin? Contact our Chicago pedestrian accident attorneys today at (312) 313-0202.